We manufacture and supply a competitive range of Data Acquisition Equipment that is provided in conformation with the market quality standards to the clients. Our products are provided at very affordable prices to the clients. these are available for different industries for measurement purposes. Further, these are highly demanded in the national as well as overseas market due to their accurate results. Backed by rich industrial experience, we manufacture and supply a vast range of Testing Lab Equipment, which are used in varied segments of diverse industries including chemicals, ceramic, construction, education, defense, irrigation, hydro power generation and mining industries. 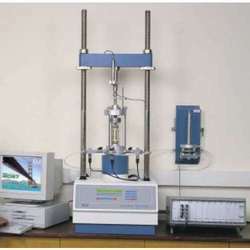 We offer these testing equipments in different configurations, specifications and compositions to the respected clients. Paratus the comparison of heat pipe with the copper pipe as good conductor of heat and with the stainless steel pipe as same material of construction is made. It consists of three identical cylindrical conductors in respect of geometry. One end of these is heated electrically while there are small capacity tanks acting as heat sinks at the other end. The unit consists of a heat pipe a copper pipe and a stainless steel pipe. Temperature sensors are embedded along the length to measure the temperature distribution and the heat transfer rate is noted in terms of the temperature rise in the heat sink tanks. the performance of the heat pipe as a super­conducting device can be studied well in terms of the temperature distribution along the length at a given instant and can be compared with other two members. Nearly isothermal temperature distribution and fast rise of temperature in heat sink tank reveals the heat pipe superiority over the conventional conductors. To demonstrate the super thermal conductivity of heat pipe and to compare its working with best conductor i. E. Copper pipe & stainless steel pipe as same material of construction. 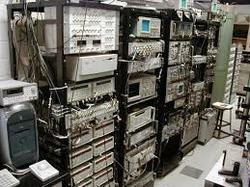 Looking for Electronic Lab Equipment ?